'So you don't want to cycle off the bioroids in section C?... Hmmm remember that "business trip" to Thailand? Perhaps your wife were to see an interesting photo album get posted to your VirtuaBook wall? ... Yeah I thought so, nice doing business with ya." Blackmail that time-honored tradition of paying someone to do something by NOT doing something, translates into Android Netrunner by allowing the runner to bypass all unrezzed ice on a server. Sling some mud: While some corp decks can produce bad publicity on their own, many do not and Blackmail is a dead card if the corp isn't floating bad publicity. Valencia Estevez: The Angel of Cayambe is by far the most popular way to do so making Blackmail potentially ready to go from turn one. Frame Job , Activist Support etc represent other ways the runner can take matters into his or her own hands to get the party started. Sooner: Planned Assault is one of several options available to make sure that Blackmail is tutorable sooner rather than later giving the runner the greater opportunity to make a Blackmail when the moment is ripest. Warning! : cards like Blacklist can screw with such a recursion strategy. Melting ice away: Servers with rezzed ice don't gel well with Blackmail, Parasite is the ice-trashing mainstay, Utensils: Forked + Knifed + Spooned can do wonders trashing ice, Crescentus, False Echo & Emergency Shutdown, Feint offer additional ways of suppressing ice by derezzing . Eater is an excellent ice-breaker for such a strategy. Knowledge based decisions: Drive By, Infiltration Silhouette: Stealth Operative are examples of ways the runner could know ahead of time whether a server is indeed worth using Blackmail to push into. 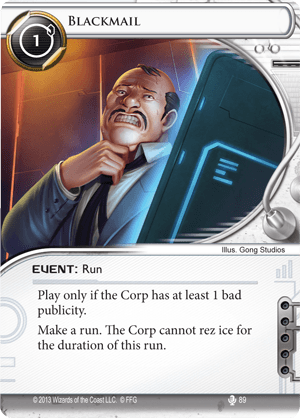 Ice Rezzing: If the corp get's wind of Blackmail being in the cards, he or she may simply rez ice during the corps turn using cards like Executive Boot Camp Eliza's Toybox, Amazon Industrial Zone, Oversight AI, so the more rezzed ice on a server directly reduces the effectiveness of using Blackmail. Dead card: If corp is able to clear bad publicity away with Restoring Face, Elizabeth Mills, Rex Campaign, Veterans Program etc then all instances of Blackmail are worthless unless the corp somehow floats bad publicity again. Blackmail's main limitation being it's requirement of having the corp float at least 1 bad publicity in order to use limits it's appeal in many decks, still under many situations it could potentially be significantly more economical than say Stimhack etc means if the runner is willing to include some kind of bad publicity inducing mechanism into their deck as well it could certainly be viable.